Prepare to say goodbye to your Monday blues cause I’ve got just the cure….chocolate! But it’s not just chocolate – it’s chocolate with some spice. Cinnamon, to be exact. It’s been more than a month since I shared a chocolate recipe (remember this Snickers Cheesecake?? ), which is entirely too long, if I do say so myself. But this recipe is sure to make up for lost time. Check out my Cinnamon Chocolate Muffins! 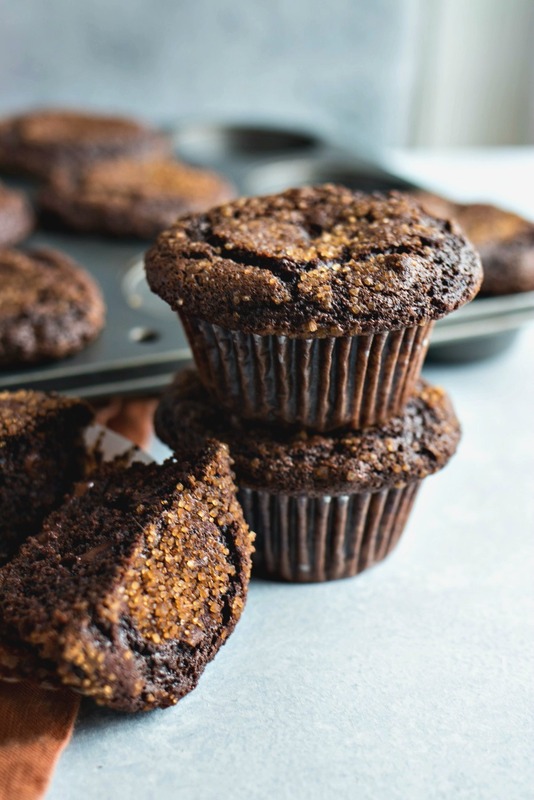 My inspiration for this muffin came from my first experience with chocolate and cinnamon. I was at a dinner party and the dessert being passed around by the caterer was homemade Mexican chocolates. I had heard of chocolate being spiced with a hint of cayenne so that’s what I was expecting from these chocolates. But instead, I took a bite and felt something more mild yet familiar: cinnamon. And to my surprise, I loved it! The cinnamon is so spicy and comforting. Pairing it with chocolate makes for a match made in fall heaven. Finally, a chocolate treat that I crave this time of year! Okay, before we get into the recipe, let’s talk about muffins vs cupcakes. What’s the difference? The biggest difference is the texture – cupcakes are delicate and light. Therefore, the batter usually has buttermilk and cake flour. But muffins are chunky and rustic and dense. So they have regular flour, sour cream or yogurt base, and usually some chunks of fruit or chocolate or nuts. Or all the above! These muffins are actually quite simple to put together. So simple, if fact, that there’s no mixer required. That’s right – you can mix this batter entirely by hand! Once you’ve got the batter ready, you simply scoop into cupcake liners, sprinkle with a mixture of coarse sugar and cinnamon, and bake for 20 minutes. Speaking of baking, there is one special tip that you need to know when making muffins. To get that raised top, you sort of “shock” the muffins by introducing them to a super hot oven (425 degrees) for five minutes and then immediately reduce the heat back to 350 to continue the baking process. Once the butter and chocolate are melted and hot, I like to add the sugar by itself and stir vigorously for 1 minute. This has two purposes: (1) to cool down the mixture quickly before adding the eggs (if the eggs are added to the hot chocolate, they’ll scramble) (2) it helps the sugar begin to dissolve so the cupcakes aren’t grainy. Though these muffins are dense, we don’t want them to be tough. So make sure not to overmix! That’s why I recommend a spatula to fold in the dry ingredients instead of whisking them in. I highly recommend using coarse sugar for the topping instead of granulated sugar. I think it looks so much better, plus, the sugar stays intact during the baking process instead of melting into the batter. And there we go – the yummiest chocolate muffin you’ll have all season (and the best cure for the Monday blues!). See you on Thursday for this month’s new cookie recipe. Any guesses on what it is?? Hint: it was on my Instagram story a few weeks ago! Preheat oven to 425 degrees. Prepare muffins pans by lining with 12 cupcake liners. Set aside. Grab a large microwave-safe bowl. Break chocolate into pieces and place into bowl with butter. Microwave for 30 seconds. Stir mixture and microwave for another 30 seconds. Finish off for another 10-15 seconds. Add sugar and whisk vigorously for 1 minute to help dissolve the sugar into the chocolate. It won't be fully dissolved but it will help the process begin. Add sour cream and vanilla and gently whisk together until combined. Add eggs and gently whisk until combined. In a separate bowl, whisk flour, cocoa powder, cinnamon, salt, and baking soda until evenly combined. Add mixture to wet ingredients and fold together with a spatula until almost combined. Add chocolate chips and finish folding until evenly combined. Don't over mix! Scoop batter into liners, filling all the way to the top. I used an ice cream scoop to make it easier but you can use a large spoon if you don't have one. Add topping ingredients to a small bowl. Using a small spoon, combine together. Gently sprinkle over the top of the uncooked muffins. Bake muffins for 5 minutes at 425 degrees then immediately turn down temperature to 350 degrees, while keeping the muffins in the oven. Bake for another 15 minutes, or until toothpick comes out clean when inserted into center muffin. Remove from oven and let cool in muffin tin for 5 minutes and then remove from muffin tin to continue cooling on a wire rack. Serve immediately or keep stored in a storage container at room temperature for up to 3 days. I made this recipe today and loved the chocolate and cinnamon combo. The only thing I would change next time, is I’d add just a tad more cinnamon to the batter. Beware, these muffins are choc-packed! Great recipe! Thanks so much for the feedback! I tried them with 3/4 teaspoon of cinnamon and LOVED it! I’m gonna try 1 teaspoon next to see if that’s even better. So glad you liked the recipe! Cinnamon and chocolate sound so delicious together! These look yummy – can’t wait to make them! Oh my gosh, cinnamon plus chocolate–those are my two weaknesses. And you made them with cake flour, pure genius! I’m going to add this to my must bake list. Wow, these look so good! You don’t often find recipes that feature the chocolate and cinnamon flavor combination, so I’m definitely looking forward to trying these. You really don’t see this combo enough. So glad to shed some light on its amazingness! These are my two favorite flavors! I’ll have to make this on the weekend. Oh! These muffins would *definitely* cheer me up, any day of the week! I love the chocolate-chili combo. I’m a fan of cinnamon, but lately it seems I’m using it soooo much! I need to try these! I know right? I just bought some ground cinnamon and it’s almost gone! Thanks for the love, Patricia! How delish will this be for the holidays and parties!! YUM and thank you for sharing! Cinnamon and chocolate together are so delicious! What a yummy treat! Thanks so much! These have become my new favorite chocolate treat! These muffin seriously look amazing! They look delicious, I love that you can change the number of muffins that you want and the recipe changes, such a lovely and helpful touch! Cinnamon and chocolate are always a nice blend! Looks yummy! These look good! I wouldn’t have thought about pairing cinnamon and chocolate but it looks tasty! Me either! But once I tried it, I was hooked!